1. Donate your pre-loved clothes, bags, shoes, toys, electronics, stationary, artwork, fashion accessories and home decor items. 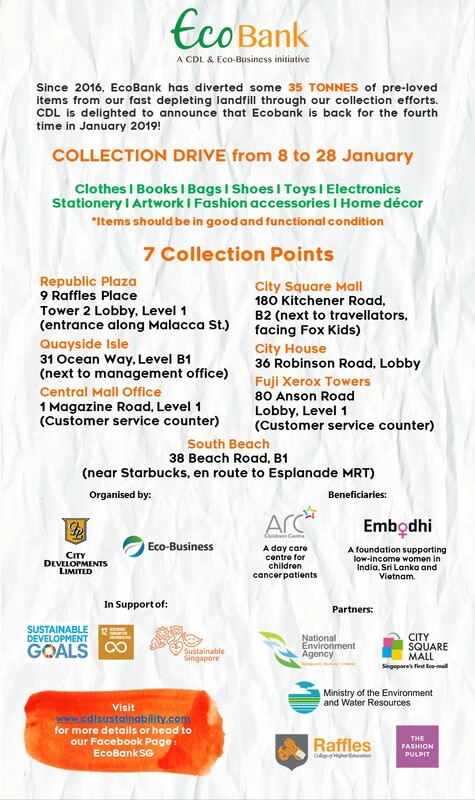 The collection drive will be running from 8th to 28th January and will be at 7 collection points islandwide. See poster for drop off locations. 2. Buy pre-loved: The items collected will be sold at the EcoBank Bazaar from March 1st to 3rd at City Square Mall. The proceeds from the sales at the Bazaar will go towards the ARC Children’s Centre a day-car center for children with cancer or other life-threatening illness(es) in Singapore. Unsold items will go to the Embodhi Foundation to benefit low-income women in Sri Lanka, India and Vietnam. 3. Volunteer: Help sort the donations received from January 14th to February 25th and/or set up and manage stalls at the EcoBank bazaar from March 1st to 3rd. As a token of thanks vouchers of $10 from City Square Mall will be offered for every shift volunteers take part in. If you are interested, do sign-up via this online registration form. Have questions, get in touch with the organizers at ecobank@eventslab.sg or call them at 68778317 or 8715 6414 (from 11 Jan onwards).